The acoustical landscape in Myanmar is very public. 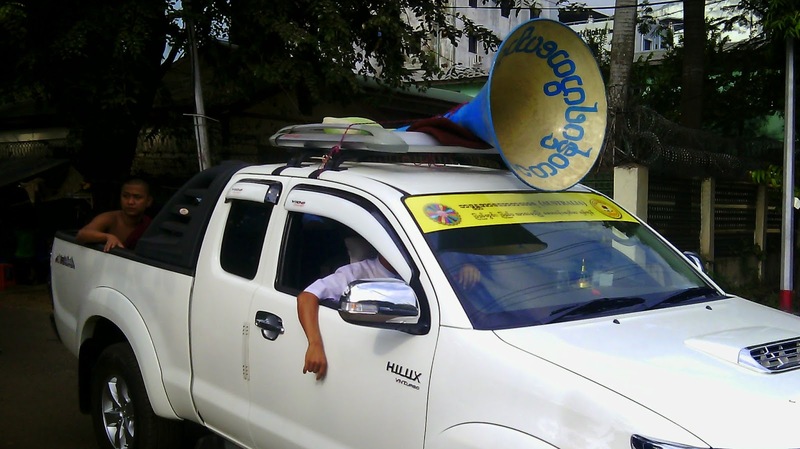 No fundraiser for a local monastery will think twice of mounting a sound system on a truck to spread the word. This morning there was one of those through my little Shan Kone Street at 8 am. No lottery seller will venture out without a looped and amplified message on his battery-driven stereo. The celebration for Mohammed’s birthday included a concert that was still going full blast at 3:30 am. I checked from my balcony. There were three persons in the audience and four musicians playing. A rough estimate of the number of people who were in earshot at that hour: 800. Many a pagoda has fantastic speakers wired up, broadcasting, in the original sense of the work, live or recorded prayer services. The main pagoda in Thaton is so convinced of its message that it reaches all within at least a kilometer of its golden dome 24/7. Just south of the Pagoda and well within its acoustical reach is a mostly Muslim neighbourhood, judging by the predominance of hijab-wearing women. A sharp contrast to the acoustical landscape of Edmonton, which is dominated by the drone of traffic interspersed by sirens of emergency response vehicles.